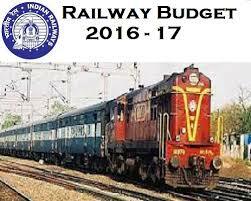 Railway Minister Suresh Prabhu on 25 February 2016 presented the Railway Budget 2016-17 in the Lok Sabha. Railway Minister Suresh Prabhu said that this Budget owes inspiration to vision of PM Narendra Modi who said ‘My vision is to make railways backbone of India’s progress & economic development’. Suresh Prabhu said that core objective is to become an engine of employment generation and economic growth at national level. Railway Minister Suresh Prabhu outlined a capital plan of 121000 crore rupees in 2016-17. Dedicated freight corridor project gaining momentum. New freight corridors announced: Delhi-Chennai, Kharagpur-Mumbai, Kharagpur-Vijayawada. Bids for setting up 2 locomotive factories was finalised and the new factories will be set up with an order book of 40000 crore rupees. Long distance superfast train Antyodaya Express for unreserved passengers will be launched. Fully unreserved superfast trains to be introduced on dense traffic route. Deen Dayal coaches for long distance trains for unreserved passengers will be introduced.